The cemetery was built in the 1840s and over the years, it slowly became an area of over 27 acres. There is a section of land with Belgian and French graves with a memorial. 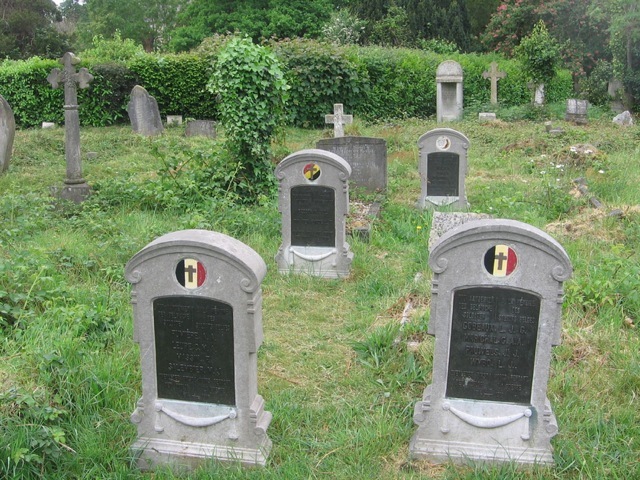 Belgium graves in Southampton Old Cemetery. Image by Matt via Flickr. The soldiers were on their way for World War One but they got killed and the bodies were moved here. Lots of families are buried here and several graves have special engravings like badges in the army, and special emblems, including one grave with a harp, showing the person’s love for music. There are hundreds graves in Southampton Old Cemetery, including 45 from the Titanic disaster. While there are headstones of the people who died on the Titanic, their bodies were never sent to the cemetery because the bodies had sunk with the ship. The headstones are marked with a blue peg. The Titanic is important to Southampton as the ship made the infamous voyage to America from Southampton harbour and the memorials in the cemetery consist mainly of workers and officers, although one passenger is commemorated there. Talking about the Titanic, two years ago, when I was in Year 6, my year group at Merdon Junior School did a performance of Titanic (No, not THAT Titanic). On HER (always call a ship her or she) maiden voyage, 14th of April 1912, she hit an iceberg, resulting in the loss of over 1000 lives. Shoes from the people who lost their lives on the Titanic. So, what has this got to do with dreaming? Well, the passengers aboard Titanic were dreaming to go to America. These shoes in the play had lost their owners. The shoes symbolise the dreamers, who lost their lives. Lots of shoes were found by a diver in the Titanic in 1985. The diver commented about how the bodies were eaten and the shoes were all that was left of the people on the Titanic. “If you’d like to go a’sailing across the ocean, you can see a world of new sights across the sea. You could search for new beginnings, in lands for the taking, across the ocean now a DREAM for you and me. Unsinkable DREAM, how grand she will seem to those who will board her. Leviathan high, just touching the skies, dear God may you keep her. I felt very intrigued by a lot of the stories behind the graves and I learned quite a bit about our local cemeteries and their history. Editor’s note: The original version of Visit to Southampton Old Cemetery was published on 27th March 2014 in Ben Williams’s World.